The name of this park combines the names of the adjacent neighborhoods in northwestern Queens – Elmhurst and Jackson Heights. Jackson Heights was primarily farmland until the opening of the Queensboro Bridge in 1909 brought a population boom. The area takes its name from John C. Jackson (1809-1889), the former President of the Hunter’s Point, Newtown and Flushing Turnpike Company. In the early 1860s, the company built Jackson Avenue, which originally ran through the entire neighborhood. Part of Jackson Avenue was renamed Northern Boulevard on April 22, 1922 by local law. The Dutch established a community in the vicinity of Elmhurst in 1652. First called Newtown, this area was briefly known during the 17th century as Middleburgh after a city in the Netherlands. From 1683 to 1898, this was the administrative center of the greater Newtown area. The neighborhood developed rapidly in the 1890s, with the Cord Meyer Development Company taking a particularly large role. When the area was incorporated into New York City in 1898, the community opted to change its name from “Newtown” in order to disassociate from the foul smells of nearby Newtown Creek. 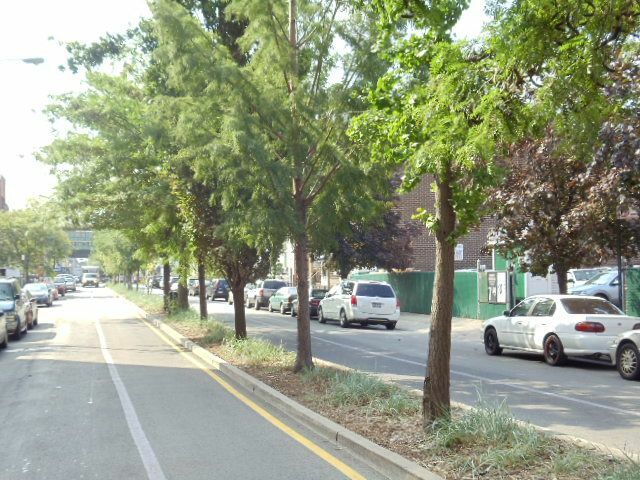 The new name “Elmhurst,” meaning “a grove of elms,” was chosen because of the prevalence of such trees in the area. Malls have undergone an interesting evolution that parallels the growth of cities. As cities began industrializing, the need for green space within cities became more acute. Among the park designs for incorporating green space within the city streetscape were malls. The first malls, appearing in 16th century France and Italy, were about 400 yards long and had a grass-covered playing field located between two roadways, used for matches of the game “pall-mall.” As the popularity of malls spread to London, people used them as places to promenade, play, and hold military parades. The first malls built in America were in New England. The first tree-lined pedestrian mall was added to the Boston Common in 1728. Malls became a popular means for developers to create attractive neighborhoods in the early 1900s. With relatively little land, a developer could turn a stretch of street into a quiet, verdant parkway, and malls could be easily applied to straight streets. As a result, street malls are a common design throughout the sections of the outer boroughs that developed during this period. By the 1960s, it was becoming apparent that widening streets and building new expressways was not going to solve the traffic problems caused by the huge increase of cars on the road since the 1920s. Many malls built in the 1960s reflect efforts to reclaim green space from the sprawling paved streets. Elmjack Mall stretches along 75th Street from 37th Avenue to Woodside Avenue. The City acquired the property between 1917 and 1932. Parks gained jurisdiction in 1923, when the Corporation Counsel gave its opinion to the Queens Borough President that a width of 70 feet along 75th Avenue should be dedicated to public use. Constructed in 1934, the mall is planted with small trees, shrubs, and flowers. At one end, on the corner of 75th Street and Broadway, there is a bronze statue of a penguin. There is a bronze flamingo sculpture on a boulder as well. Along the length of the mall are cast iron bollards that protect the median from errant vehicles. In January 2000, Volmer Associates L.L.P. funded plantings including the Magyar upright ginko (Ginko bilboa ‘Magyar’), Abbotswood bush cinquefoil (Potentilla fruticosa ‘Abbottswood’), Pink beauty bush cinquefoil (Potentilla fruticosa ‘Pink Beauty’), Primrose beauty bush cinquefoil (Potentilla fruticosa ‘Primrose Beauty’), Red ace bush cinquefoil (Potentilla fruticosa ‘Red Ace’), and Colaratus wintercreeper euonymus (Euonymus fortunei ‘Coloratus’).